During the six months that a 31-year-old man named Mario was held at the Adelanto ICE Processing Center, an immigrant detention facility in the Southern California desert, he repeatedly became ill with fevers. Each time, he wasn't allowed to see a doctor for many days, he said. "It just came to the point where we were not even putting in medical requests because we said, 'What for?'" said Mario, who has lived in California since he was 5 years old. Mario's experience is echoed in a new report by federal inspectors that details inadequate medical care and other serious violations of Immigration and Customs Enforcement's own detention standards at the Adelanto facility, California's largest immigrant detention center. The review, by the Department of Homeland Security's Office of Inspector General, shocked even veteran watchdogs of ICE and injected urgency into longstanding calls for the agency to remedy problems at the jail. "We've been long concerned about conditions at Adelanto," said Michael Kaufman, an attorney with the American Civil Liberties Union of Southern California. "But I have to admit that even I had my breath taken away when I read some of the things that are documented in this report." The review comes as California's attorney general's office is conducting its own first-ever investigation of federal immigration detention centers in the state. A 2017 state law gave the attorney general power to monitor conditions in public and private immigration jails across California. A dentist who said detainees could use "string from their socks to floss" for dental hygiene, as the facility only provides floss to detainees who pay for it. A disabled man who was confined to his wheelchair for nine days and nights without being allowed to sleep on a bed. A blind man with limited English and more than a dozen others who were held in disciplinary segregation even though they had not been found guilty of any rule violation. Detainees waiting weeks or months to see a doctor, and in some cases, more than a year to see a dentist. Nooses made out of braided bed sheets hung from vents at 15 out of 20 cells inspectors visited, which could aid suicide attempts. Inspectors were troubled by the nooses because there have been at least seven suicide attempts at the facility since 2016. In 2017, a 32-year-old Nicaraguan man, Osmar Epifanio Gonzalez Gadba, died after he was found hanging from bed sheets in an Adelanto cell, according to the report. Medical care deficiencies, and the inability to see medical professionals in a timely manner, contributed to the deaths of three detainees at the Adelanto center since 2015, the report said. "ICE must take these continuing violations seriously and address them immediately," wrote Homeland Security investigators. ICE officials agreed to conduct a full inspection of the Adelanto facility starting Oct. 10 and to ensure corrective actions are completed by Jan. 31, 2019. "The safety, rights and health of detainees in ICE’s care are of paramount concern," said an ICE spokesperson in a statement. 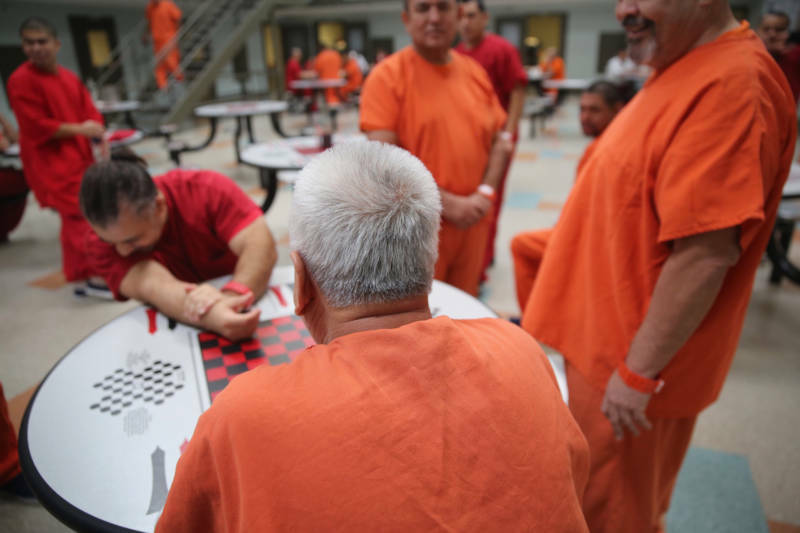 California's first-ever investigation of federal immigration detention centers began last year. The DHS inspector general's report will be considered in the state review, according to a spokeswoman for Attorney General Xavier Becerra. She declined to say whether state investigators have visited Adelanto. "We cannot comment on the specifics of our ongoing review in order to protect the integrity of that review," wrote the spokeswoman who declined to be named. Statewide, at least eight federal detention centers hold nearly 5,000 detainees per day, according to ICE figures. "The federal government's own report is validating our concerns," said state Sen. Ricardo Lara, D-Bell Gardens, who authored the 2017 law requiring state inspections. "It makes it much more important for California to have a bigger role in investigating what is really happening in the detention centers." The Trump administration is seeking to overturn the law, AB 103, in a lawsuit that also challenges the state's sanctuary law. This summer, a federal judge in Sacramento denied that request, but the federal government has appealed. Lara said the DHS inspector's review should help California win that court case. "It shows why California had to take action," he said. But the state's review is not expected until March 2019. That's too long to wait, say immigrant rights advocates, who worry about the welfare of the non-citizens detained at Adelanto, which has more than 1,900 beds. "The lives of these people are pretty much at risk," said Luis Suarez, with the Inland Coalition for Immigrant Justice. Suarez visits detainees and helps them file grievances with ICE, but he said those complaints generally go "nowhere." ICE does not adequately follow up on problems or consistently hold facilities accountable, according to a separate report from the Department of Homeland Security's Office of Inspector General earlier this year. That leads to "some deficiencies remaining unaddressed for years." 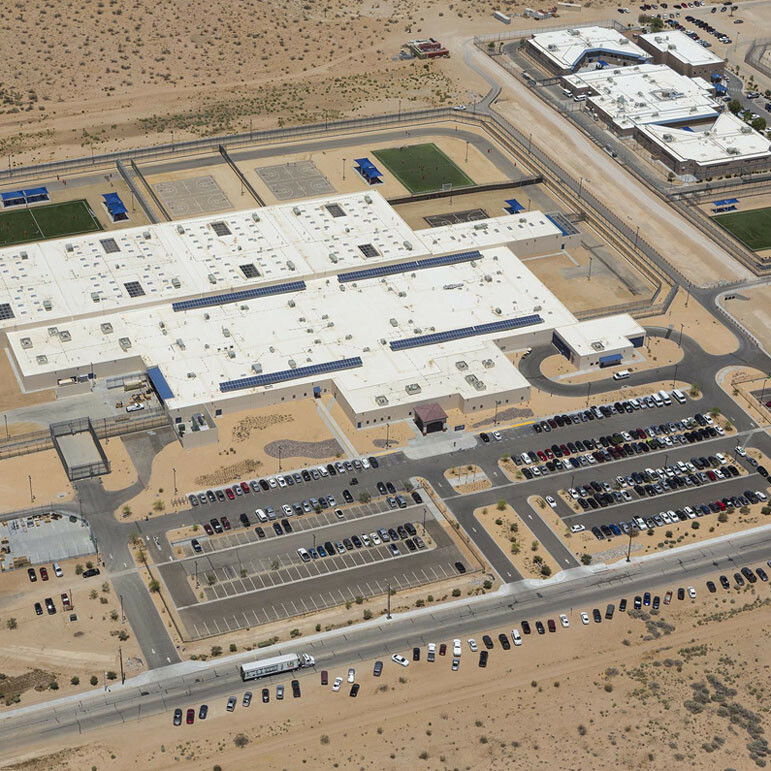 The Adelanto center is operated by the nation's largest private prison company, The GEO Group, which owns and/or manages 139 detention, correctional and community re-entry facilities nationwide. Pablo Paez, a spokesman for The GEO Group, said the Florida-based company believes that some of the findings lacked "appropriate context or were based on incomplete information." Still, he said, the company is taking action. "We have already taken steps to remedy areas where our processes fell short of our commitment to high-quality care," Paez said. "While we are proud of our record in providing safe and secure environments, we take full responsibility when faced with shortcomings and pledge to redouble our efforts to ensure safe and humane treatment in all of our facilities," he added. ICE spends more than $2 billion a year on immigrant detention through private jails, but previous reports document inadequate medical care and staff training in the private prison industry. The GEO Group is not investing enough to ensure the well-being of detainees at Adelanto, said the ACLU's Michael Kaufman. "Every dollar that they save on medical care or on staffing is a dollar that they make on profit," said Kaufman, who said he has heard detainee complaints about the facility since it opened in 2011. Kaufman said that ICE and The GEO Group have taken "no meaningful steps" to correct problems with timely medical care that the ACLU outlined in a 2015 complaint to ICE. And, he said, similar concerns extend to other immigrant detention facilities in the country. "Adelanto is by no means an isolated incident," Kaufman said. 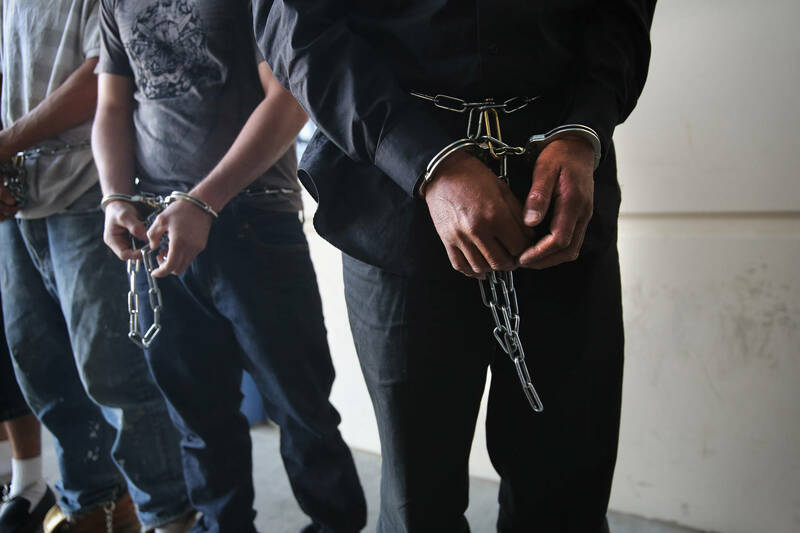 "I think what Adelanto and many other cases make clear is that ICE is simply not taking seriously their constitutional and legal obligations to ensure the well-being of people in their custody." A Guatemalan asylum seeker, who is transgender, said she suffered head-pounding pain from a severe ear infection while she was held at the Otay Mesa Detention Center near San Diego. She said it took five days to see a doctor after she told guards she was in pain. "It was a torment for me," said Luna Guzman, 24, who also described being beaten and harassed by other detainees. "You feel that the world is ending." Guzman's asylum case was rejected, and she was deported in April 2018 after eight months of detention at Otay Mesa, which is run by another private prison company, CoreCivic. Mario, the former detainee at Adelanto, said he fears being jailed there again. He used to be a recipient of Deferred Action for Childhood Arrivals (DACA), which provides protection from deportation and a two-year work permit to immigrants brought illegally to the U.S. as children. But Mario was convicted of a misdemeanor DUI and was unable to renew his DACA status. Soon after, ICE agents showed up at his house and arrested him, he said. Though Mario is no longer locked up, he said he wanted to speak out about the detention conditions for other people languishing at Adelanto. "I really want to be able to help make a change because there are a lot of people there that are still going through this," he said. "It's time that people really find out what's going on."